In this project we are aiming to establish an architecture to remotely control a mobile robot that can collect information of all devices around. The information can be used to retrieve the API of associated devices from a database on a server so that people can control those devices via the mobile robot over the internet. 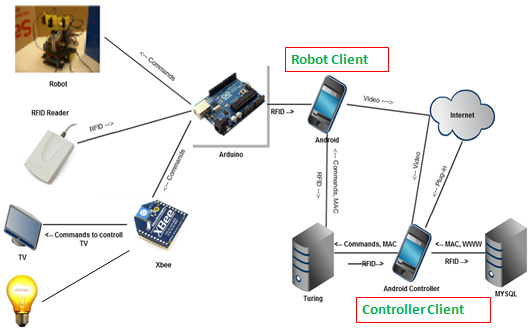 The mobile robot is embedded with an Android phone so that it can be easily connected to the internet to stream a video image to navigate the robot and control the surrounding objects.